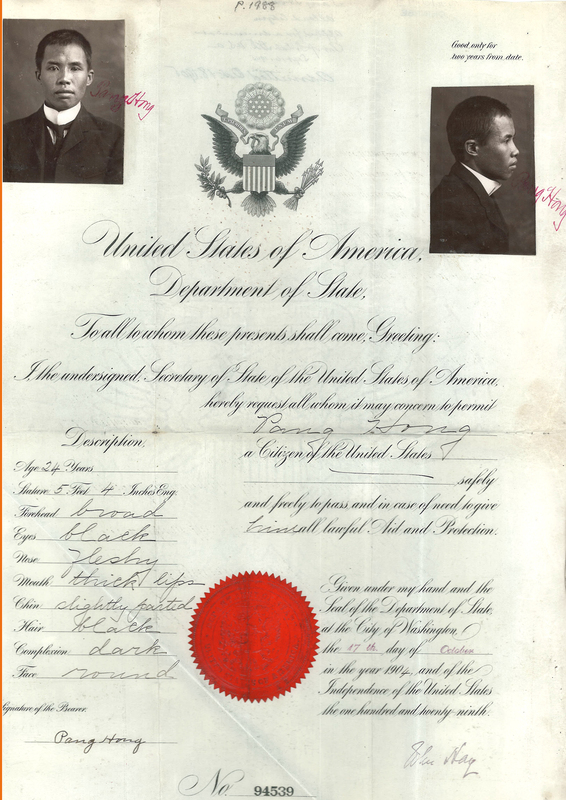 “Pang Hong’s Passport,” 1904, Chinese Exclusion Act case files, RG 85, National Archives-Seattle, Pang Hong file, Seattle, Box 1333, Case 39924/6-16. 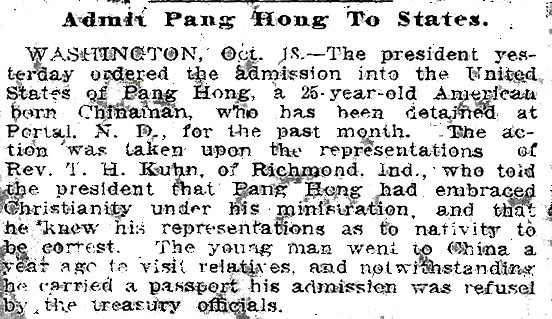 In November 1904 Pang Hong applied to Immigration to visit his family in China. His uncle, Pang Wah Tip, testified for him. His return trip in September 1905 was through Portal, North Dakota and his destination was Frankfort, Indiana. He was detained in jail in Portal for almost a month. On 2 October W. J. Palmer, his lawyer wrote to the immigration office explaining that he and Rev. T. H. Kuhn had filed the necessary application and affidavits for Pang Hong, a U. S. citizen, and had even obtained a U. S. passport. Twelve days later, on 14 October, Pang Hong was still in jail. Thirty-two members of the Christian Church in Frankfort signed a letter testifying that Pang Hong was a “truthful honest person, a citizen of integrity, and has taken a constant interest in the church.” The signers were: Thomas N. Lucas, Quincy A. Kennedy, E. A. Spray, A. M. Kern, M.S. Canfield, M.D. (Elder); J. H. Comley, Elmer Detwiler, Deacon; E. H. Whitake, Deacon; C. E. Bickley, C. H. Gillis, David S. Kern, J. A. Lucas, N. T. Rice, C. T. Keller, A. Michael, M.D. ; H. C. Eldridge, Ellis D. Mines, Rev. W. J. Russell, J. C. Caron, M.D. ; Ed Ross, Emma Ross, Mrs. T. N. Lucas, Katharine Lucas, Sarah E. Lucas, Mrs. G. A. Smith, Namie Haller, T. R. Spray, L. C. Brooke, C. H. Doctor, Marry Merrill, James McClomrock, and Mrs. C. E. Boulder. This unidentified newspaper article dated 18 October  was included in the file. Unidentified newspaper article dated 18 October  Pang Hong file, Seattle, Box 1333, Case 39924/6-16. When Pang Hong applied to leave in 1921, Immigration Inspector Brekke in Chicago approved his application reluctantly because of discrepancies in the file. He said it was very doubtful that the applicant was American-born but the applicant was found to be an American citizen by the department on appeal in 1905 and in 1912 so it would have been difficult for them to re-open his file. Pang Hong was 41 in 1921. He was testifying about events that happened when he was 12 years old. Some of the discrepancies were concerning the exact address of his father’s cigar factory in San Francisco, which floor they were living on, how many floors the building, the names of the other families living in the building and other minor differences.